What’s one thing that brings people together? Food! And cooking food together is a great way to spend quality time with your kids, plus the entire family can participate! Cooking and baking can also help development in early childhood and even for your baby! 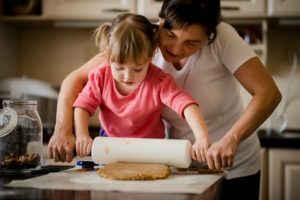 Learn how your child can participate in the kitchen and which skills cooking with you can develop. Just always be sure to practice kitchen safety. Keep young children away from sharp knives and hot stoves, and use your best judgment when deciding if your child is ready for a more challenging tasks. With that in mind, let’s get cooking! Now, there aren’t a lot of ways for baby to help in the kitchen at this age, they are just a baby after all, but being in the kitchen with you can still be beneficial for them. Since baby is probably already in their highchair while you’re cooking, try making your time in the kitchen a learning experience. • Cooking is a great sensory experience for kids of all ages – even babies! They will experience many new smells by being in the kitchen while the food is cooking. 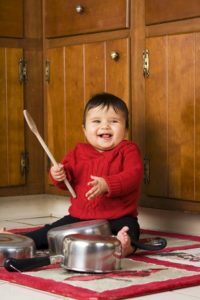 • Watching you move around in the kitchen can help baby with visual tracking. • By explaining and talking through what you are doing, you are helping baby’s communication development. At this age kids are able to start helping, with a little prep from you. • Practicing counting skills by counting out eggs or other ingredients. • Scooping and pouring ingredients are both practice for fine motor skills. • Talking through the recipe together and talking about ingredients can help build their vocabulary. • There are many sensory experiences in the kitchen. Have them listen to sounds of the electric mixer or food being added to a hot pan. Let them feel bread or dough by helping knead it. • Participating in cooking can help with picky eaters. Encourage your little one to try some of the ingredients, but don’t force it. Being around and becoming more familiar with new ingredients will eventually help them want to try new things. Learn about the differences between a picky eater and a problem feeder. • Following simple directions with one or two steps is essential while cooking and is great practice for future school activities. Don’t forget: You should always supervise your child in the kitchen! As your child continues to grow, they can take on more responsibility in the kitchen. Add new tasks slowly and continue to review kitchen safety rules with them. When you feel your child is ready to start cutting and dicing, be sure to talk about how to hold the knife, how to position your hand, and additional safety instructions with knives (i.e. Do not try to catch a dropped knife; do not put a knife in a sink full of dirty dishes and water). • Cooking is a chance to put math skills to good use by telling time to determine when a dish will be done cooking, using fractions when measuring ingredients, and more! • Your child can read the recipe out loud to you. There still may be words they haven’t heard or seen before, but it is good practice. • Following recipes is great for sequencing practice – what do we need to add first? Why did step 1 have to be done before step 2? • Cooking serves as a opportunity to talk about food, healthy eating choices, and planning balanced meals. Use this chance to start a conversation! • You can also improve communication skills while cooking by talking about favorite foods, memories around mealtimes, and how all the steps of the recipe contribute to the finished meal. • Helps your child learn how to manage more responsibility when they know they need to follow the recipe’s directions from beginning to end and clean up afterwards. Safety reminders should still exist as they begin handling more kitchen equipment. • Preparing the meal can increase your child’s appreciation of the food they are served, knowing all the hard work that goes into making it. • A confidence boost! Accomplishing the goal they were set out to do, seeing the finished product, and seeing their family members enjoy the meal they prepared are all great confidence boosters for your child. As you can see, there are many different ways your child, no matter the age, can benefit from cooking in the kitchen! So choose a recipe, grab an apron, and open your refrigerator. Happy cooking! 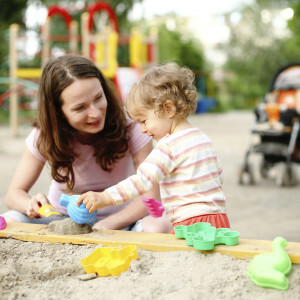 Have fun and promote development with sand play! 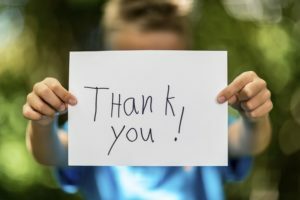 Promote an attitude of gratitude with these 7 ways to encourage your child to be grateful.